How do I Assign Role Based Access to my Employees? Security roles are very essential part in all the platforms to prevent confidential details. Only the super user can access all application modules. It is very easy to manage all employees’ roles. Log in and access "Employees App" from your universal navigation mneu bar. In Employees app dashboard, you can select the employee to give the app access. For that you will pick "More Details" for the respective employee to view the employee information. For instance: Stella Desailly. In the overview page, scroll down to see “Access Privileges” at the bottom and click "Add" button to see all roles. Click on "+" icon to add roles and click "Save" button to update the changes. You can view the roles based on the apps also. 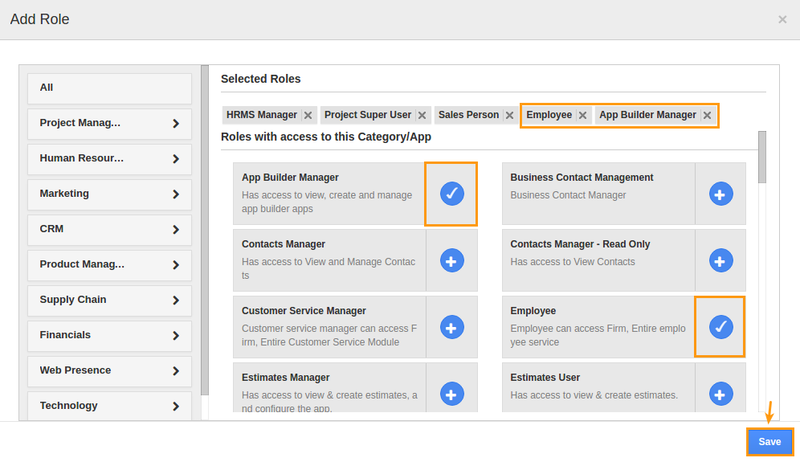 For instance: Here we had selected App builder Manager and Employee. Click on "Remove" icon to remove the roles assigned before. Click here to know more about Security Roles.